Watching a debate regarding simplifying simulation software is like watching two old political adversaries take shots at each other. It’s interesting as long as the beer is cold and there’s more of it. I spend a lot of time working with various simulation and analysis applications, and can understand exactly what each side is arguing about. The problem centers on the simulation and analysis software, and the perception by many that the results are valid, no matter what was done to obtain them. “Analysis was performed and found the part to be safe. The report says it’s good. Ok.” This could not be farther from the truth; however, all that can be done to ensure your analyses are valid is to carefully stand by results that reputable firms furnish. You see, analysis results are only as good as the analysis preparation. No more, and no less. The software will report on things that don’t jive in terms of the underlying mathematics, but it can’t tell if the test was not prepared correctly. However, what happens when a company upgrades to a new software product that is powerful and complex. If a qualified analyst doesn’t understand the complex software, then he or she may not get the results that were expected. The difference, I suppose, is that the analyst will recognize that something has gone awry, where the idiot wouldn’t. So what’s to stop an idiot from getting complex analysis software and churning out reports right now? Absolutely nothing. Keeping the complexity built into the software simply attrits the lazy idiot. The determined ones keep on churning out reports. As Autodesk is at the front of the line when it comes to user interface (UI) simplification, I thought I’d ask them what they thought. Bob Williams, Product Marketing Manager for Autodesk Simulation, gladly answered some questions about the company’s direction. Bob, as you may recall, came to Autodesk with the Algor acquisition, and is well versed in the mechanics of simulation software and its UI progression. JE: What is your take on the company-wide push for democratization of engineering software? level of simulation to be used at a given time in the product development process?’ It is not about making every simulation feature available to every single user.Having been with Algor since 1996, I have routinely experienced the debate of ‘dumbing down simulation’, and higher-end users being concerned that we are making it too simple for others. These are legitimate concerns. It’s really more of a focus on ‘what is the right level of simulation to be used at a given time in the product development process?’. Over the years, you’ve seen that many simulation companies have gone one way or the other: either for the high-end, not paying enough attention to ease of use for their customers, or in the complete opposite direction, where it’s all about ease of use, including dismissal of engineering terms in favor of ‘simplified’ ones. Where we’ve [Autodesk] come in is to say that there is a place across that entire spectrum, and the way in which you deliver technology is actually different, depending on who you are trying to get to use the technology and at different points in the [design] process. JE: As far as I’m concerned, if the engineering practice required to understand certain simulation processes demand higher learning, then so-be-it, but the software interface could still be made easier to use. Am I wrong in saying that Autodesk has adopted this approach? BW: No, you’re correct. So, let’s look at a couple examples. We [recently] talked about Inventor Optimization technology. That is a simulation-powered tool that, honestly, doesn’t even need you to realize that you are performing simulation. It’s more of a designer tool. You’re sitting in the design environment, you’ve been given some parameters and criteria (perhaps by your engineer), and you’re working with this design envelope to get a feel for what you can and cannot change. That is simulation, but that is simulation at an appropriate level for that point in time in the product development process. In the same way, the Autodesk Moldflow Adviser plug-in for CAD (and its predecessor on Autodesk Labs, Project Krypton) is a tool powered by simulation which is intended for a designer at a given point in the process. As I am designing a plastic part, I can at least get some initial, early-on feedback as to whether or not this thing I am designing could actually be injected with plastic and formed into a part. Both of these technologies are leveraging simulation, but in ways that have never been done before. Again, it’s giving you the appropriate level of simulation, with the appropriate level of complication, for what it is that you are doing at that point in time—bringing simulation earlier into the product development process. When you need to go deeper and move into something more powerful like Autodesk Simulation Mechanical, you’ll find it’s powerful as can be, but it’s also easy to use. You don’t have to have one or the other; there’s no reason why you can’t have something that has lots of power, but at the same time, you can get from point ‘A’ to point ‘B’ pretty quickly, because it’s organized intuitively within a very modern UI, similar to your design environment. Autodesk Moldflow is another example. We have 2 product lines. Adviser software suits the part designer that needs to do more than just sitting inside Inventor and designing plastic parts, but doesn’t want to get carried away with injection molding analysis. It delivers guidance along the way as to what the designer should be doing, but if he or she needs more capability, they can always move to the Insight products which let them go substantially deeper. We’ve really taken an approach of having a spectrum that goes all the way from inside the CAD environment, designer-oriented tools, all the way to advanced simulation technology for the expert. 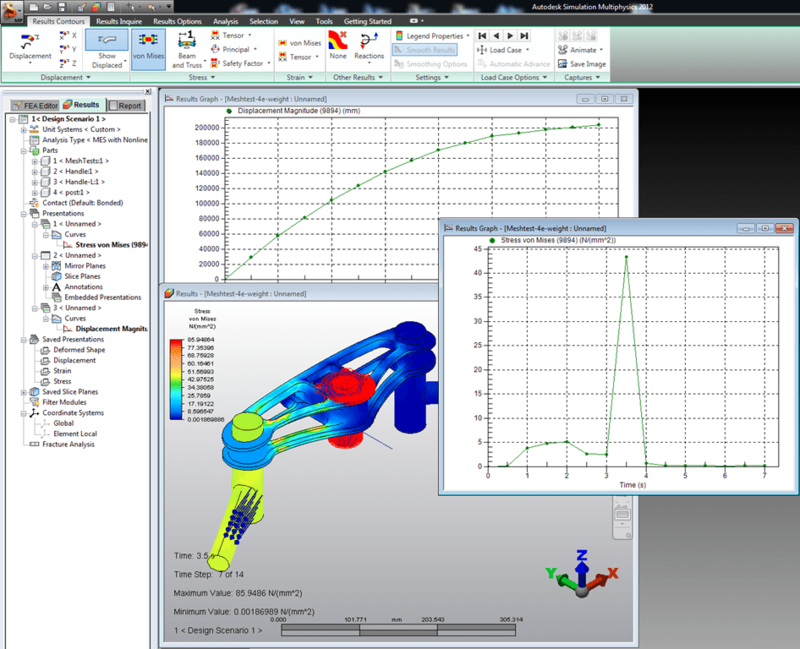 Many people within a company may use various levels of simulation. We just don’t accept the fact that this stuff has to be hard to use or difficult to navigate. There’s no reason for it. An analysts’ value is not in figuring out how to click buttons in a complicated user interface, an analysts’ value is in being able to apply their knowledge into appropriate inputs and parameters, and more importantly, properly evaluating the output from a simulation and determining what that means and what changes need to be made because of it. That’s the value of an analyst, and the faster you can let an analyst get to that activity, the more valuable they are. JE: Did Algor or any other acquired simulation technology lose functionality in the wake of streamlining and simplifying the UI? We just don’t accept the fact that this stuff has to be hard to use or difficult to navigate… An analysts’ value is not in figuring out how to click buttons in a complicated user interface, an analysts’ value is in … properly evaluating the output from a simulation and determining what that means and what changes need to be made because of it. BW: No. Both Autodesk Moldflow with the 2011 release and Autodesk Simulation (previously known as Autodesk Algor Simulation) with the 2012 release went through the process of moving to the ribbon toolbars, the standard Autodesk UI, and with neither did we have to remove simulation functionality because of that UI update. Moving to an easier-to-use interface doesn’t require you to lose simulation power. Typically, when that happens from a software company, it was a conscious decision that the target audience didn’t need that level of power. Again, let’s return to the Inventor Optimization example. That is not a tool for analysts; it is a tool for designers to be able to optimize their design in the CAD environment. Is it pretty narrow in terms of all the simulation bells and whistles? Yes, but that is by design, not because of UI limitations. JE: Is there anything else you’d like to add regarding this topic? BW: Think about the product design process. Early on, you’re trying to narrow down your design options. Do you need it to be within 3% or better accuracy at that point in time? Absolutely not. You need to be able to quickly weed out options and narrow the possibilities down. So, you can actually accept a lesser level of accuracy. In the past, you didn’t do any of that; you didn’t take any benefit of what simulation could tell you. You were just trying to figure it out using other things, and then you get all the way to the end, and it was a matter of some analyst looking at the thing and then giving you a check box telling you whether or not what you designed is safe. Well, guess what, that’s not an optimized design, and you are probably spending more money than you need in order to get it manufactured. It’s all about trying to determine directions that you can go, and as you get closer to manufacturing, your need for better accuracy gets higher, and that’s when you’d be using different types of simulation, and with that, more experienced people are joining the process. It’s a logical flow and what happens in a best-in-class product development process. Autodesk Simulation MultiPhysics 2012 - Nodal Analysis during 1G deceleration + turning force. This analysis took substantial time in order to validate the setup, and more to evaluate results. While the results are amazing, they can be easily misunderstood. This is one example of the concerns in the simplification debate. I still firmly believe that the debate has a specific purpose, much like any progression of change driven by intelligent people. It’s like checks and balances, where things gradually change to benefit the majority, guided by the constant pulling back and forth of an educated and experienced populous. I would never condone making up ‘cutesy words for engineering terms’, and rewording things such as Non-Linear Materials and Meshing Aspect Ratio. If someone does not understand a term used in engineering practice, then it should serve as a road sign that indicates a need for more study, and to come back later. Responsible professionals will do just that. Irresponsible team members should not be permitted to do any forms of analysis, or analysis preparation. What I would, however, like to believe is that as software and analysis technology grows and is transformed, that better implementation of engineering usability will be merged in along the way.